Terrorist organisations are increasingly using high-grade encryption technologies to prevent being caught by the law enforcement. But, that was not in the case of last year's Paris attacks that killed 129 people, as Encryption seems to have played little to no role. So, Who was the Real Culprit Behind the Attacks? Burner Phones, or Prepaid mobile phones, are often the quick, easy, and anonymous method of communication. All you need to do is head to your nearest big-box store and pick up a cheap prepaid "burner" phone and a phone card. Now you have an entirely useable phone with no ID that could reveal your identity. 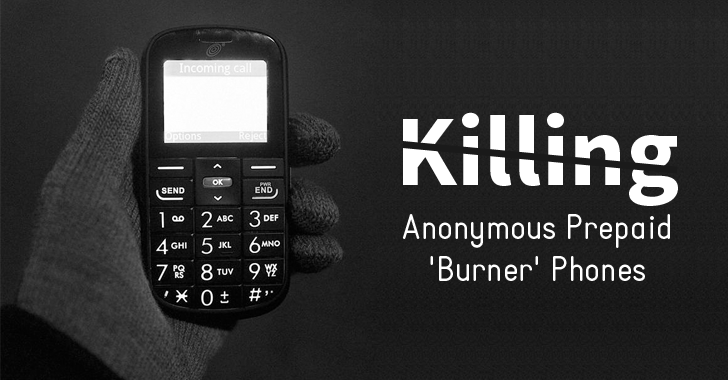 It seems that these prepaid "burner" phones are a dream tool for terrorist organisations that bring them in bulk and then disposed of each time they make a communication. The same prepaid phones were utilized in the terrorist attacks in Paris late last year. Therefore, by using different phones and mobile phone numbers each time, the terrorists evade the bulk metadata collection programs by Western intelligence agencies, making hard for the law enforcement to catch them. So, to deal with this issue, Lawmakers in California have proposed a new bill that would force prepaid "burner phone" retailers to record and verify the personal identification of buyers upon purchase of prepaid phones or similar mobile devices, as well as SIM cards. However, the bill will not eliminate the existence of burner phones. Rep. Jackie Speier of California has introduced the proposed bill, dubbed the "Closing the Pre-Paid Mobile Device Security Gap Act of 2016," or HR 4886, which will require retailers to ask prepaid device buyers for their proper identification. The information would need customers to verify their personal identity through a credit card, or a Social Security number or driving license number, forcing similar obligations on prepaid phone buyers as people who sign up for a new mobile contract. "This bill would close one of the most significant gaps in our ability to track and prevent acts of terror, drug trafficking, and modern-day slavery," Speier said in a Wednesday blog post. The 'burner phone' loophole is [a glaring gap] in our legal framework that allows actors like 9/11 hijackers and the Times Square bomber to evade law enforcement while they plot to take innocent lives." "The Paris attackers also used 'burner phones.' As we have seen so vividly over the past few days, we cannot afford to take these kinds of risks. It is time to close this 'burner phone' loophole for good." The proposed bill aims to make life harder for terrorists, human traffickers, drug dealers, and other criminals who have nefarious reasons for using easily disposable phones. Although a burner phone could be registered with a fake ID or someone else's stolen identity, the bill would put a limitation on bulk buying of these prepaid devices by terrorists. Since the bill was just introduced, it would have to go through Congress and the President to become law.